The Laguna Pro-X Spray Booth is streamlined. It's 31" design fits through most standard doorways. A table top spray booth is a must have for safely spraying glazes and paints whether airbrushing ceramics, metals or other crafts. Spraying Applications: The standard fan, motor and filters sold as accessories to the Laguna Table Top Spray Booth are for use with water based, non-flammable and non-toxic materials. This motor may be purchased from Laguna Clay Company. For safety reasons, a special motor is required when spraying flammable materials. Use of toxic or flammable materials may require a more sophisticated air filtration system. Venting and ducting : A primary function of your table top spray booth is to vent and collect overspray. This is accomplished by three components: the filters, the fan, and the ducting. The filters catch most of the over-spray. Glaze particles that are pulled past the filters will generally collect in the plenum behind the filters. While the installation of your benchtop spray booth is not complicated, many communities regulate the use and installation of such equipment, and we recommend you contact an HVAC contractor to ensure compliance with local building, environmental and safety requirements. Filters: Laguna Clay Company offers two types of filters for the Laguna Pro-V or Pro X Spray Booth –styrofoam filters or long-lasting aluminum filters. Both filters are baffle design and should be washed after each spraying session. A set of two filters is required for the Pro –V booth, and one filter for the Pro X. Some filters are not reversible and must be positioned as indicated by air-flow indicator. Fan and Motor: Exhaust fan/motor systems are available for both the Pro-V and Pro-X. Laguna has done extensive testing to ensure that the exhaust systems are properly matched to the booth size and static pressure created by typical booth installation. The standard motors are single phase, 115V. The Pro-V motor can be adapted to either 115V or 220V. Motor Mount: While the fan & motor can be mounted on the plenum at the back of the booth, it is often desirable to run ducting from the plenum to an outside wall or roof-mount, thus separating motor and fan noise from the room in which the spray booth is being used. 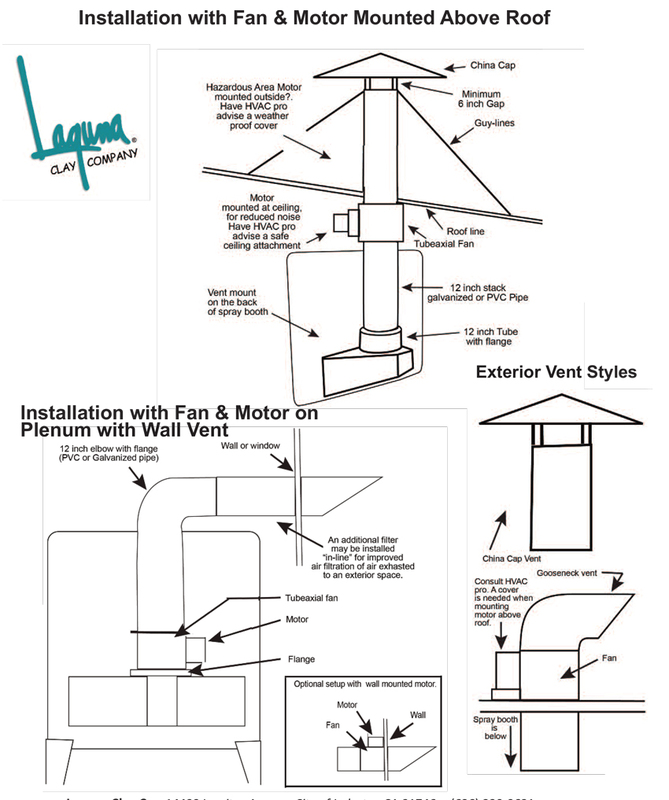 This is an alternate way to set up your fan and motor however, your HVAC or electrical contractor can help you explore all available options for the Laguna table top spray booth.